Just a short update as we’ve completed our time at the The Florida Association of Public Insurance Adjusters (FAPIA) at Spring 2018 Conference that was hosted in the Sanibel Harbour Marriott Resort & Spa. We had a great time and met a lot of great people within the industry. Will follow up later with more information from the show, but people were really interested in our ability to help them with infrared /thermal imaging for detection of moisture — a valuable asset for property owners, attorneys and public adjusters when they’re needing precise documentation related to insurance claims and possible legal issues. You can see our booth set up here and our drone which we also used to capture footage at FAPIA events. 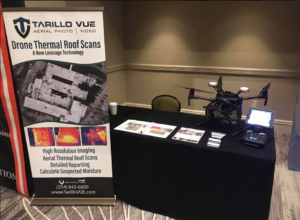 Tarillo Vue provides thermal drone imaging inspections for companies across Florida.